eD@HoMe: 2 Awesome Icelandic covers!! G'day! Another 2 awesome Icelandic covers to share with you on this lovely day. 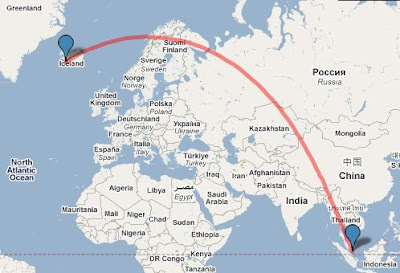 The first cover was sent by Benedikt. Thank you very much! 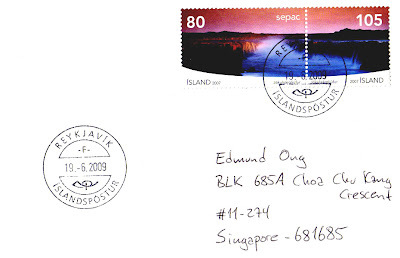 The pair of gorgeous stamps franked on this cover belongs to the "Jökulsá Canyon" series, issued on 1st Oct 2007. They depict the largest Canyon in Iceland. 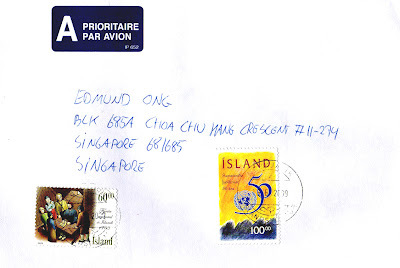 The next cover was sent by an eBayer. The two beautiful stamps franked on this cover are from the "Census of 1703" and "50th Anniversary of United Nations" series respectively. They were issued in 2003 and 1995. Both covers feature postmarks dated 19th June 2009 in Reykjavik and took 5 days to travel an estimated distance of 11,512kms to reach me.